It is important that you use this Main Site in all of your everyday marketing. Make it the boldest, most prominent part of every home ad, sign, vehicle, business card, stationary, hat, T-shirt, magnet, calendar, postcard, and envelope you use. Let your imagination run wild. Your Main Site is attractively designed to set you up as a top Real Estate Professional by putting you well above the image of your competition. What should your home page look like? What should an effective home page look like? It should reflect your business and goals, while offering your visitors tools and information that will keep them on your site. Most people who are looking for a home are looking for a site that will help them find a home as quickly as possible, and an agent that will help them achieve that goal. Remember, time on the internet is precious. Most people who use the internet are impatient. You may only have a few seconds to capture their attention before they move onto your competitor’s site. Are you paving the way to their new home, or putting up roadblocks? Let's take a look at some examples of home page elements that will enhance the user experience and bring people back to your website. Why do people come to a real estate website? Mostly to search for homes. Th e faster they can do that, the better. If you are using IDX Broker, a quick search widget can easily be installed on your home page. If you can’t use IDX Broker, speak to your MLS or IDX provider to see if they offer a 3rd party widget that we can install for you instead. 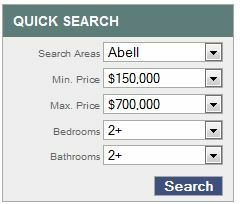 A quick search widget allows visitors to immediately start looking for homes through your IDX Broker account or MLS. The top banner or toward the top of your site is the most ideal place for this tool. A standard widget can be installed for no additional charge. Please speak with your client care rep to have one installed if you don’t already have one. Of course you are going to offer other services on your website besides searching IDX. Or perhaps you are not able to use a quick search widget (see above), so you need to entice people to search your site through other means. Calls to action can help motivate visitors to use your site for specific purposes. Most of our basic website designs come with calls to action on the inside pages, such as the Listing Alerts and Home Value graphics. Depending on your website design, it may be a good idea to strategically place these graphics on your home page as well. Click here for button examples. If you find some you like, contact your client care rep and they will be happy to place them on your site. Whatever form your calls to action take, they accomplish the purpose of directing your visitor to a specific place on your website that will not only provide them with a service they need, but also provide you with valuable lead information, providing you are directing them to a lead source such as the Listing Alerts or Home Value pages. Your website comes to you with content already on the home page, but it’s up to you to take it to the next level. You know your area. You know what you can do for your clients. So now is the time to write about it. It’s best to keep your content focused on SEO-enhancing words, especially city and community names, real estate terms, and services you specialize in. You need to do this all while making your content readable, informative, and inviting. Featuring your social media pages can help you stay more connected with your clients. Placing social media icons on your home page will show that you stay in touch with your client base, while making it easier for visitors to find your social pages. These icons can be placed in the main banner by request (free of charge) or you can place them in the home page content through the admin panel as linked images (see article on how to place images). Marketing Your Stealth Sites - Promoting Services, Not Identity! The methods for marketing your stealth sites apply to your Listing Alerts, Home Value, Bank Owned, or any other stealth sites you may have. The basic way to market these is to publish the domain names for these sites anywhere and everywhere you advertise. The more places people see these domains, the more leads you will acquire. Get Free Alerts of New Listings As They Hit the Market! Visit www.yourlistingalertsdomain.com. Get an Analysis of Your Home’s Approximate Value Emailed to Your Inbox! Visit www.yourcmadomain.com. Other methods of getting leads to you stealth sites would be by pay-per-click, short newspaper ads, and craigslist. To get more information on these methods, either click on the words above or just scroll down to those topics. “Want to know your homes approximate market value? Our automated system gives you complete home value details by e-mail, without having to reach an agent”. By putting these stealth site ads on the flyers in your info boxes, you are reaching the target prospects you want and will turn a non-productive system into a highly profitable system. Ads can be done in many different ways. The most effective ads are primarily non-branded in nature and offer the prospect easy, hassle-free access to information. Ads can run in home publications, newspapers, money saver publications, local publications, school or club bulletins, etc. These ads can be directed towards sending your prospects to your E-mail home search site, your IDX home search site, your CMA site, Bank-Owned site, or any other stealth site you may have. Some of the most effective ads can also be the least expensive. One example is to scatter 4-8 short ads in the classified section of your newspaper, preferably on Sunday when readership is highest. Magazine ads are most productive in home publications where you are targeting a concentrated group of buyers and sellers. Your system includes the ability to generate a Craiglist post in HTML that you can easily insert to promote your listings. All you have to do is copy the code and add it to Craigslist. Here is an example of what the ad looks like. Postcards are great tools to draw leads to your sites. By far, the most effective postcards are those that approach the consumer in the same non-branded manner that the stealth sites do. These postcards do not identify you as the Real Estate agent and are solely designed to send consumers looking to find information to an information web site. By using this kind of postcard, you may significantly increase the number of responses you get in any of your marketing efforts. Your postcards need to be designed to hit the consumers’ hot buttons; to lead them to the information that they need and want and assure them that it is hassle-free. In many cases just adding the verbiage “without having to reach an agent” will significantly increase your response. Pro Leads is a proven lead generation service available to RPS Platinum, RPS Gold Plus, or as an upgrade to RPS Gold. Internet "lookers" often just want information; they don't want to immediately have a conversation with an agent. Our dedicated Pro Leads team places paid search engine advertisements that drive home buyer prospects to a dedicated stealth marketing web site. Once on the site, they can register to request home search information. When a buyer prospect registers, they are automatically enrolled in your buyer's drip email campaign to incubate them into prospects. Since your buyer's campaign provides helpful tips along with your home search results, buyers stay engaged until they are ready to speak with an agent. Since you've been helping them all along, chances are that when they are ready to work with an agent, they will call you! You choose what your Pro Leads monthly budget will be, based on your market and your marketing budget. The Pro Leads team identifies the most cost-effective choices for your market, and places the ads. The most popular search engines are considered, including Google, MSN and Yahoo. Since the number of leads generated will vary according to the local market, the price per lead will also vary. In markets where several agents want to use the Pro Leads service, the advertising costs are shared and the generated leads are distributed proportionally. Pro Leads is a powerful addition to your online marketing arsenal. Generate more leads by putting Real Pro's experienced Pro Leads team to work today! As people enter your system, you begin building a database of leads. You will find that some are ready to take action NOW and others may take some time. You have approximately a year of auto-response e-mail messages that start from the time the lead took initial action, but you need to keep yourself in front of the less active leads for an indefinite period of time. An excellent way to do this is with your monthly e-mail newsletter. Your system comes complete with an e-mail newsletter template. Use this to keep in touch with your leads on a long-term basis. You can easily use the newsletter content provided by Real Pro, or you can create your own. Then, select the database you wish to send to and with a click of your mouse you can hit hundreds or even thousands of leads easily with your personal monthly newsletter. Remember, if you are the agent in front of them when they decide to take action, you get the call. Weekly e-mails are extremely important. One very effective method is to hit your entire buyer database weekly with a short informational message that is personalized. Keep this message to a few sentences and make it informational. Messages that mention good mortgage rates, good home inventories, etc. will work. Always end the message by asking them to take action. To create these messages you simply go to your systems e-mail manager, enter your message, pick the group you want to target and with a click of your mouse a personal message from you is delivered on your e-mail stationary to each lead in that group. The object here is to invoke a response from your database. Once you invoke a response and begin personal dialogue with a lead, your chances of doing business with that person grow significantly. One rule of thumb here is to be prompt. Check your e-mail regularly and when an e-mail arrives from one of your leads, reply immediately. This will greatly increase your rate of conversion. These updates work to keep you and your name in front of all the leads in your database. As your database grows, this marketing brings more and more business. Morning coffee is an inspirational message that is updated on your Real Pro System Platinum, Gold or Silver* website on a weekly basis. The messages are neutral and are not religous or real estate based. They are just nice, friendly ways to “touch” your database (leads and current clients). It is something everyone can relate to. Its purpose is to keep you top of mind while sharing something non-business related. A soft touch… a kind thought. You can send Morning Coffee any time you like. It can be once a week, bi-monthly, or monthly. Just be sure not to send it daily since it is updated weekly on your website. Keep in mind how many other ways you are communicating with your database and be sure not to overwhelm them with too many emails. Optimizing your Real Pro Systems website can be done in several ways. Adding content that is relevant to your market area is a key factor. A balance needs to be struck between content that contains relevant keywords, yet is readable. Make sure that you talk about the areas you serve and the services you provide as much as possible, while still writing content that is readable. Click here to get a detailed list of things you can do to enhance your visibility. Blogging can boost your marketing, establish you as a leader in your area, and help grow your business. Boiling it down, blogging can help achieve two major goals: First, attract website visitors, and then convert them into leads and clients. Why do blogs matter? Blog articles help people find you when their interests (via web searches) match up with the material you write. While blogging helps your search engine optimization (SEO) – think of this as your “findability” online – by providing content, you don’t need to be an SEO expert or a “techie” person. If you blog regularly, address real concerns, and provide real answers designed for specific target groups (i.e., markets), you build your “SEO snowball.” It takes time to grow your online visibility but blogging can be a big help. Click here to learn about blogging and how to blog effectively. Leads come from all kinds of sources - other systems you may use, your open houses, people you meet at networking events and so on. Take advantage of your Real Pro automated follow-up drip campaigns and incubate your leads until they are ready to do business. Just email us your leads in an Excel or csv file. We need a minimum of the first name and email address to do the import and will send you a disclaimer to sign. You can then start them up on a drip campaign and keep in touch. Real Pro can also automatically import leads from many sources using our LEI System. Click here to learn how this program works and get a sample of sources we currently have programmed. Your sites are set up to help you capture leads. Each time someone fills out a form, the lead is captured and put into one of your automated e-mail drip campaigns. These e-mails promote your services as well as your stealth sites and are sent out on your custom branded stationery. 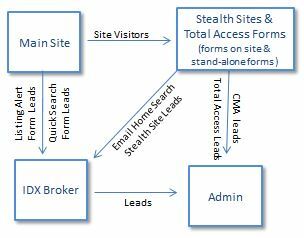 Lead capture from your stealth sites are set up to market from one site to another. The most effective is from the IDX site to the E-mail home search site. When a lead enters your IDX site and takes action, a set of auto response e-mail messages automatically direct your lead to visit your e-mail home search site and take advantage of the automated e-mail updates. Although it is easier to attract potential buyers to your IDX site, the conversion rate from lead to client is higher at the e-mail home search site because the lead receives home information along with relationship building auto-response e-mail messages. You also have flash ads in your splash page that direct visitors to your e-mail home search stealth site. This is extremely effective as visitors go through your site looking at your listings, etc.